ARE YOU FOCUSED ON VALUE ACTUALLY DELIVERED? Many companies are poor at this. Instead they provide large customers with MI on products/services taken, expenditure patterns, information on new products being launched, service against SLAs etc. That isn't value created. Value tends to include business advantage gained - costs down, risks down, revenue up - additional to standard requirements in the contract, and often covers areas that even the supplier doesn't know it directly or indirectly impacts! 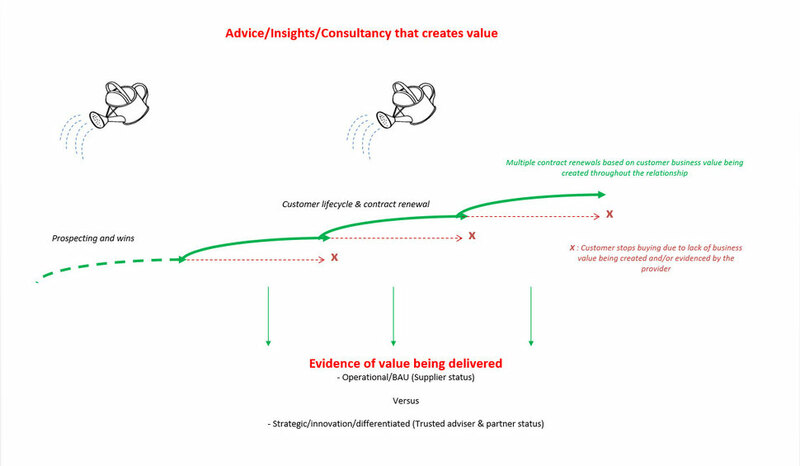 Are you watering your customers with insights and advice but also demonstrating value delivered?